When it rains it pours and when it pours basements start filing up with water. Most of the time it is pretty obvious when this happens, you go downstairs and the squish of the carpet tells you everything you need to know. Sometimes when water makes an intrusion it is not as obvious. Maybe the sump pump didn’t break but couldn’t keep up with the deluge. Water may have seeped into just the edges of rooms where you don’t walk or in closets filled with storage containers. While the carpet may not be noticeably wet the drywall where the water came in or the pad underneath maybe quiet saturated. You can fight this by keeping your nose alert to any new odors that suddenly spring up especially if they are musty. Water which has been able to go undetectable has a large chance of doing damage to your home via discoloration, rot, and even mold growth. If you do smell a new and unwelcome odor in your basement after a large rain try to follow the scent and try to find some kind of visible indication of what the cause could be. Here at SERVPRO of Northeast Wichita we do free inspections for mold and water intrusion and while it is better to bring us in if you have an idea of where water may have made an intrusion we bring thermal cameras, water meters and a wealth of experience which can help even if you haven’t been able to find a source of a new odor. So give us a call at: 316-684-6700. How long will your Water Damage take to Cleanup? As the water soaks into the carpet it also soaks into the wall which can further lengthen dry times. Nobody plans to suddenly have 3 inches of standing water in their home so regardless of whether a water damage started from a broken pipe or excessive rain it needs to be taken care of as quickly as possible. In this situation the longer water sits the more bacteria grows, odors become stronger, water soaks into more materials and the change of microbial (mold) growth increase. That is why calling restoration experts as soon as possible like the ones here at SERVPRO of Northeast Wichita is imperative. As a homeowner your first step should always to address the source of water intrusion. Even simply turning the water off until the professionals arrive can greatly decreasing drying time since it will help reduce the scope of your water damage. If you are experiencing a water damage call us on our 24/7 emergency line: 316-684-6700. Our Highly Trained Restoration Specialists can Restore your Wichita Home! SERVPRO of Northeast Wichita is certified with the Institute of Inspection, Cleaning and Restoration Certification (IICRC) which is non-profit organization which sets standards and certifications for the inspection, cleaning, and restoration industries. The IICRC in addition does research for the those standards of restoration which we follow and releases those into handbooks such as the S500 which has the guidelines for handling water damage. Conduct business with honesty and integrity by presenting consumers with accurate information. All jobs have a formally trained technician who has passed all required tests. 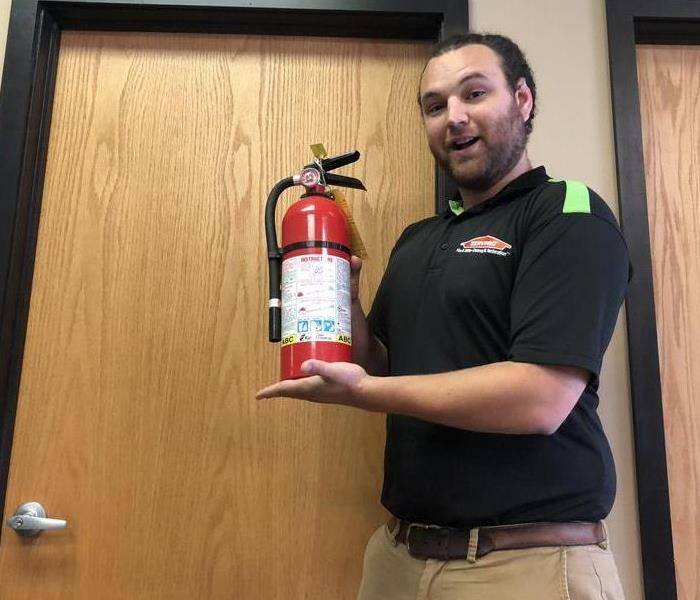 SERVPRO of Northeast Wichita specializes in the cleanup and restoration of residential and commercial property after a fire, smoke or water damage event. Our staff is highly trained in property damage restoration and we are an IICRC Certified Firm. We believe in continuous training: from initial and ongoing training at SERVPRO’s corporate training facility to regular IICRC-industry certification, rest assured our staff is equipped with the knowledge to restore your property. This is an example how soot tags look. You can see how easy it is to assume they are spider webs covered in soot. Being fire restoration specialists we have seen a lot of fire damaged homes and businesses in Wichita, KS over the years. Sometimes the extent of the damage is very evident especially when the damage is on the walls and ceilings of homes. Other times the most extensive part of the damage is in the attics, or trapped between walls where it is unseen until we dig in with our inspection. 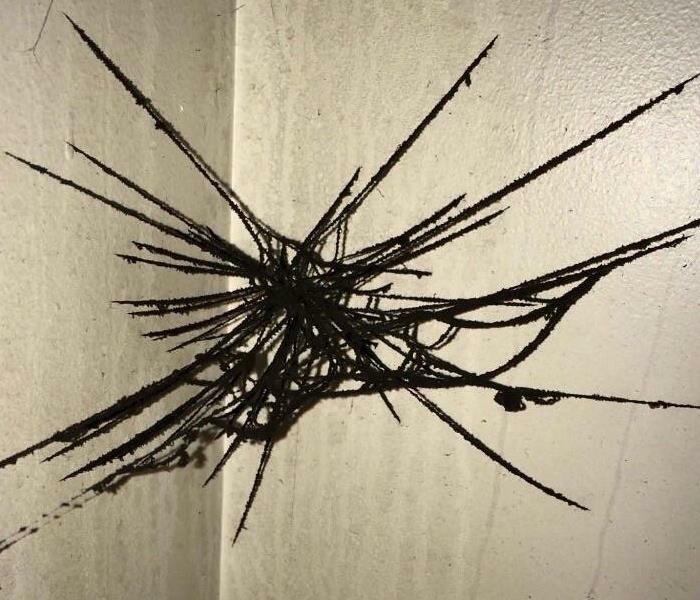 One of the most common visible instances of fire damage are the black spider webs that seem to spring out of nowhere after a fire. These spider webs are actually called “Soot Tags” and actually don’t have anything to do with spider webs. So you can put your worries to rest because there is no such thing as “fire spiders” as one of our customers put it. Soot Tags form in areas of low circulation when petroleum/synthetic based sources burn. In a fire the heat of the fire moves into colder areas since the air seeks to create equilibrium. Since that soot is riding the air with that heat soot particles follow the air into those colder areas with low circulation and are able to concentrate. Since that soot is a product of combustion the particles themselves are charged which makes it quite easy for them to create long chains of soot or soot tags. So while it looks like a lot of soot got stuck on pre-existing spider webs it is actually a whole new structure. If your home of business in Wichita is affected by smoke or fire damage give us a call so we can start making it “Like it never even happened.” at (316) 684 – 6700. An example of a fire extinguisher, note do not hold fire extinguishers close to sources of heat. Owning a home in Wichita, KS means there are many different dimensions of home ownership you must have knowledge about and today we are here to help you with one of those areas. In the past we have written about fire safety and steps that you can take to minimize the risk of fires. We still are giving out smoke detectors and emergency plans so contact us for those today! In this post we will go over what is the best fire extinguisher type for your home. Class A: These extinguishers excel at putting out, textile, plastic, wood, trash and paper based fires. These extinguishers use the chemical monoammonium phosphate. Class B: These extinguishers excel at putting out oil, paint, grease, gasoline and kerosene based fires. These extinguishers also use monoammonium phosphate as well as sodium bicarbonate. Class C: These extinguishers excel at putting out electrical fires and utilize monoammonium phosphate and sodium bicarbonate. Class C extinguishers do not conduct electricity. When choosing a fire extinguisher also consider that the class rating refers to effectiveness and area covered by the canister. The larger the number the larger the area it covers. Buy the largest canister that you can operate yourself. Typically people use a 5 pound canister for kitchens or laundry rooms while many choose to have at least a 10 pound canister for their garages. Remember that fire extinguishers are only to be used when a fire is contained and found early. Once the fire has spread the safest thing to do is exit the building and call 911. When a fire occurs in your home or business contact a fire restoration specialist and your homeowners insurance agent as soon as possible to begin the restoration process. For more information check out our fire page here. Is Mold A Problem For Your Wichita Home? Mold can spread through a home in Wichita in as little as 48 hours. Mold naturally occurs indoors and outdoors nearly everywhere. Microscopic mold spores drift through the air and can enter homes and business through AC/Heating systems, doors, windows, or even by landing on people or pets going. Mold is able to robustly grow when exposed to moisture and that growth can turn into colonies that may produce irritants and allergies. When treating mold step one is to insure that the initial source of moisture which allowed a colony of mold to grow has been stopped so that the mold will not return. Often times you may be tipped off to the presence of mold by the musty odor that it often produces. Even having high humidity in your home or business can lead to mold growth. Keep it in check by maintaining indoor humidity below 45 percent. If you suspect that your home or business has a mold problem, we can inspect and assess your property and use our specialized training, equipment, and expertise to remediate your mold infestation. We do free inspections and estimates in the Wichita, Andover, Derby and surrounding areas. If You See Signs of Mold, Call Us Today – (316) 684 – 6700. When Storms or Floods hit Wichita, KS SERVPRO is ready! A photo of one of our crews loading up during a storm event in Wichita, KS! SERVPRO of Northeast Wichita specializes in storm and flood damage restoration and have weathered several storm events in Wichita, KS. Our crews are highly trained and we use specialized equipment such as thermal cameras to restore your property "Like it never even happened". If it is a large storm event it may mean that many people in Wichita, Derby, Andover and the surrounding areas need emergency restoration services. This could mean many other companies here in Wichita will have waiting lists. When that happens SERVPRO of Northeast Wichita is able to call in reinforcements from other SERVPRO's from Lawrence, Tulsa, and other surrounding areas and make sure that you get the help you need as quickly as possible. We have done it before to great effect! We can also call for help when huge damage hits Wichita. We can call for help from all 1,600+ SERVPRO's to run a coordinated effort to help people recover from whatever may occur. SERVPRO of Northeast Wichita has gone to other cities such as Houston after a Tornado or Kansas City after historic flooding and been apart of such efforts. For more information about storm damage check our storm damage page. Have Storm or Flood Damage? Call Us Today 316-684-6700! 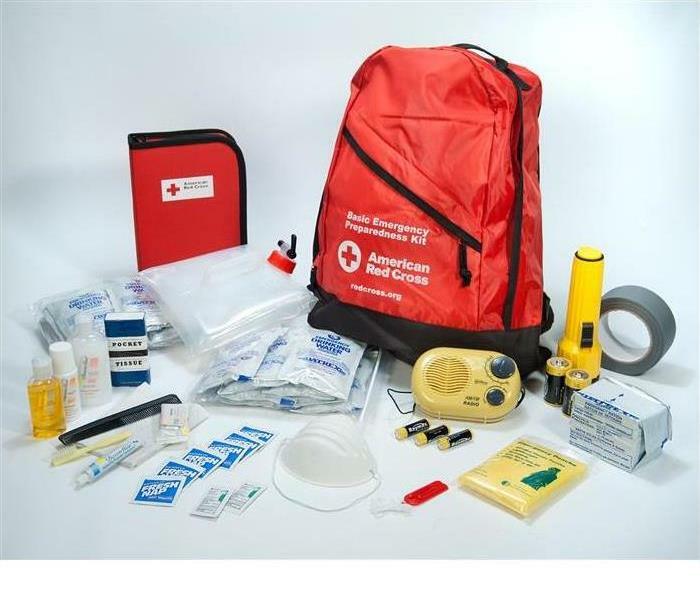 This is an example of a disaster kit which might help you visualize putting together your own. Wichita, Derby and Andover have all had their share of power outages and water damages caused by power outages. Aside from outages due to historic ice storms most power outages in our area haven’t lasted very long so many people have not taken steps to ensure they are protected in case of an extended power outage. Depending on the severity of a disaster it could take days for emergency workers to reach you which means you should have sufficient water, food, and supplies to last 72 hours. Once you have put together your emergency kit make sure everyone knows where it is stored preferably in a central location in your home which you would go to in case of a Tornado or some other disaster. Also you will need to check the batteries and state of the food and water so that you can change out any item which needs it. Of course there are many other measures you can take to be prepared and consulting the Red Cross is a great way to continue to prepare yourself so you can be “Ready for whatever happens”. Furthermore consult you can consult our blog post about fire safety and our efforts with the red cross to make sure you have your home protected from possible fires. Don’t End up Smelling like a Flood. This Wichita Hotel experienced a sewer back up so in addition to making sure everything was disinfected making sure the odor was gone was imperative. Many Wichita businesses who experience a water damage often do not consider the odor that can linger in a building after a flood. The foul odor often smells like sewage and can indicate that mold growth may have occurred or that the water damage has not been adequately dried. No matter why it smells a foul odor is unacceptable for your business because it can drive away your customers. That is where we come in. The best way to remove odors from a structure is to prevent them from happening in the first place. In many cases foul odors are caused when water damage is allowed to sit and fester for several days. Even clean water that you could drink will smell like sewage after being allowed to fester for several days. When we arrive on site we are taking as much water out of your structure as possible through extraction. This speeds up the drying process because it removes as much “loose” water in the structure as possible which leaves the remaining “bound” water. That bound water is water that has soaked into the carpet, drywall and other porous materials. That is why we use equipment such as Airmovers and Large Grain Refrigerant Dehumidifiers to get the remaining moisture out as fast as possible. If a strong odor is already present regrettably it means that some of the structure and inventory must be thrown away. Items such as carpet pad, carpet, fabrics, furniture and even structural items such as drywall could possibly hold odors and need to be discarded in order to remove odor from a structure. Removing items that can be removed during the initial damage can stop them from ever developing an odor. What you smell when you smell a water damage is the metabolic process of various bacteria that either came in with the water or developed as the water stagnated. That is why using a disinfectant on the affected area can drastically reduce or stop the development of odor after a water damage. In the event of a water damage at your business give us a call at (316) 684-6700 and we can come evaluate what needs to be done to stop a sticky situation from becoming stinky. 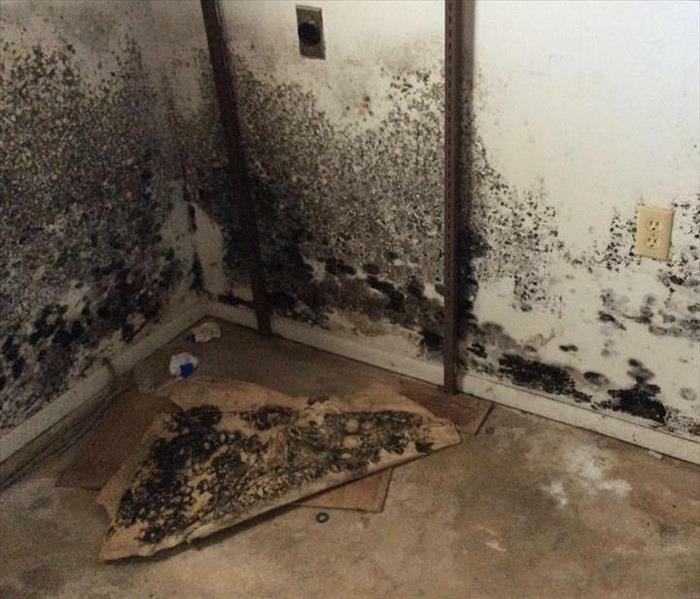 The mold growth seen in this Wichita, KS home was not due to any intrusion of water. It was simply left empty with nothing to bring down the humidity. We excel at mold remediation here at SERVPRO of Northeast Wichita especially when it comes to mold in crawlspaces. We have the training and experience to quarantine the infestation, filter the potentially harmful spores out of the air, remove the contaminated materials, and help prevent future microbial growth all with a transferable warranty on our work for 2 years. Mold in your workplace or home? Imagine you were getting something out of a utility closet at work, and you found mold growing on the back wall. Maybe a pinhole leak from a pipe created an ideal situation for mold to grow in this closet. With the HVAC system in such close proximity it risks taking the mold spores in the air and spreading them throughout the office. We can help you identify the leak if necessary and once the leak has been stopped we can begin our remediation work to ensure healthy air for your employees and customers to breathe. When our SERVPRO of Northeast Wichita professionals begin a mold remediation project step one is to block off the rest of the building from the mold. The visible mold is gross to look at but because mold releases microscopic spores into the air it can negatively affect people’s health when they breathe those spores. Each job is different but in most cases our SERVPRO mold mitigation team will set up containment and create negative pressure with our air scrubber. This simply means that the mold spore infested air in the work area doesn’t migrate out of the contained area because air is being sucked into the affected area rather than being blown out. Drywall, carpeting, ceiling tiles, and other organic materials are ideal footholds for mold when they are wet. Typically they must be removed in the mold remediation process especially when the mold has started to deteriorate them. 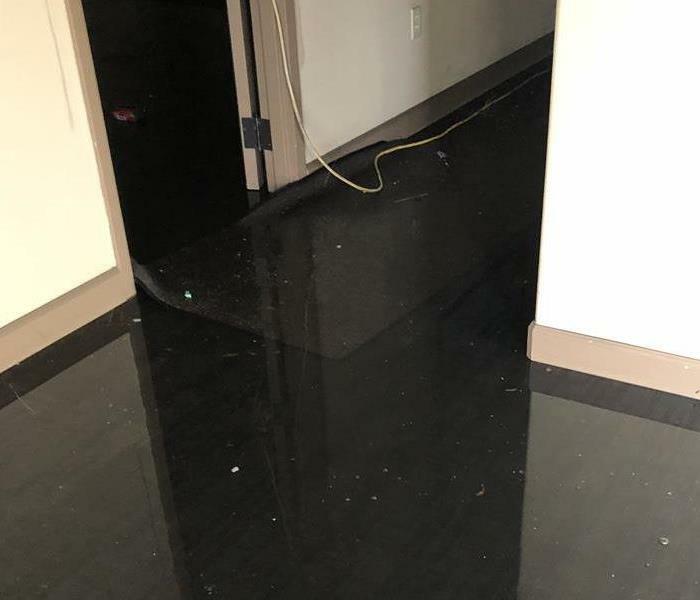 This is why it is best to contact us immediately when a water damage occurs because it is much safer and cheaper to take care of a water problem than a mold problem. Removing these materials will cause the spores to be put in the air which is why we use containment, negative pressure, air scrubbers and pre-treatment methods before removing contaminated materials. Even though we have been remediating mold here in Wichita for nearly 20 years we cannot say for certain mold will never take hold again. Mold exists in non-significant amounts everywhere and if those spores find the right temperature, moisture and nutrient source there is always a chance mold may start growing again. Since we methodically follow industry guidelines on mold remediation we reduce the chances of that happening to as close to 0 as humanly possible. Call SERVPRO of Northeast Wichita for Mold Today! If you see mold in your business or home make us your first call at 316-684-6700. We offer free inspections, free estimates and free advice on how to handle your situation. Our free estimates even apply to getting into crawlspaces and attics! 3/19/2019 - How Odor can help you Protect your Home. 1/21/2019 - How long will your Water Damage take to Cleanup? 8/14/2018 - Our Highly Trained Restoration Specialists can Restore your Wichita Home! 8/1/2018 - Is Mold A Problem For Your Wichita Home? 7/24/2018 - When Storms or Floods hit Wichita, KS SERVPRO is ready! 6/11/2018 - Don’t End up Smelling like a Flood. 5/16/2018 - Got Mold in Wichita?